→How to dry hunting boots you should know ? It is possible that your hunting boots may get wet while you are hunting during rainy season. It is unknown to anyone when drizzly rain occurs that leads to fat drop rain. Even though you have taken all precautionary measures to avoid rains during hunting, climate is highly unpredictable. When you are hiking in some open valley, a sudden rain may make your hunting boots wet because of waterlogged conditions. Even in a dense forest with a canopy of damp ferns, tall pines, your hunting boots may get saturated with water. Your boots may be water resistant but that doesn’t stop heavy rain to make your boots wet. 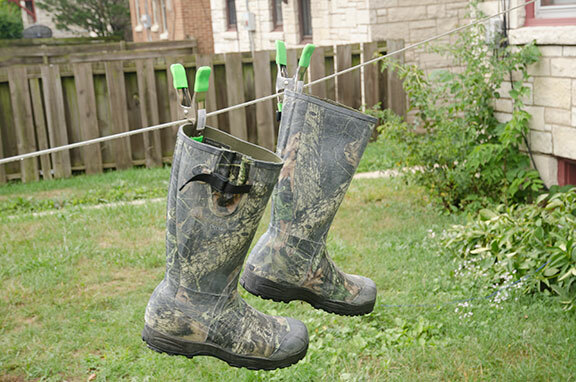 It is essential for all the hunters to know intuit boot drying technique as it helps in drying their boots in the midst of forests. This technique should be known to everyone before starting for hunting especially in rainy season. There is a particular procedure to dry hunting boots through this technique. It is easy to dry boots in forest with the tools available there. 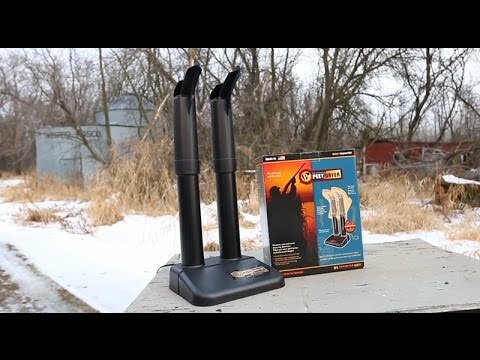 You should get some tools before drying your boots using this technique. You should try to get a stick to which the hunting boots are tied. The stick should be chosen in such a way that it can hold the weight of the boots. The stick should also have some branches and shoulders and is placed above the ground with some support. The laces should be taken off from the boots and tied in reverse to the stick such that the boots are suspended from stick upside down. To tie the boots in reverse, a half square should be done at the ankle position of the boot. The laces should then be wrapped under the arch. The boots are then tied and suspended from the stick. Some sort of heat should be placed beneath the boots so that they are dried. This heat is given through some portable gas stove which provides sufficient heat to the boots which are tied to the stick in upside down position. The stove should be kept ignited until the boots are dried. It could be as long as an hour which depends on the damping ability of your boots. This method is effective but is not the only method to dry your boots. But this intuits way of drying boots is the best and easy technique to dry boots in the midst of forest. It is highly difficult to dry your boots which are made of leather and are of great thickness. Any hunting boot has some kind of membrane that allows water or moisture to get off from your feet in order to keep your feet dry. Once this leather is saturated with enough moisture, it makes your hunting boots useless and hence they should be dried. The leather of your boots should be coated with some wax cream and then should be water proofed. It somewhat prevents your boots to maintain dryness. Hence, conditioning is the easiest way in keeping your hunting boots dry. All the hunting boots have some small pores through which water enters the boots. If such boots are conditioned, you can really maintain your boots dry without hurting yourselves. Some hunters cannot keep themselves away from hunting even during snowfall. In such times, there are more chances of getting your hunting boots wet. So, hunters should take care of some precautions to keep their boots dry even in snowy conditions. One should be cautious when drying boots as it promotes excess loss of oils. Hunters should know that some parts of hunting boots get wet faster than the other parts and hunters should take more care of such parts. Such parts of boots are applied with wax so that moisture can be retained in sufficient quantities without allowing excess water to enter into the boots. All these precautions take only a few minutes but they can do more benefits to your boots. There are many waxes available in the market which can be applied on hunting boots. But, many products do not completely support your purpose of keeping your boots dry. It is the responsibility of you to choose the best wax available in the market. Nikwax and Granger’s are the two waxes which serves your purpose in snowy and rainy climates. Sometimes, a single coat may not be sufficient to restrain water to enter into your boots. A few rounds should be coated on hunting boots in such cases which helps your boots to be healthier keeping your feet dry thereby providing longer life. With all these precautions, you can enjoy your hunting without bothering about the waterlogged conditions in your path.